LUSAS Civil & Structural is a world-leading finite element analysis software application for the analysis, design and assessment of all types of structures. Many real-life illustrative uses of the software can be seen by visiting the civil and structural case study page. 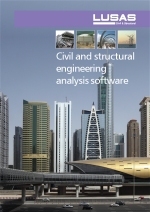 LUSAS Civil & Structural is available in a choice of software levels; Civil & Structural LT, Civil & Structural, and Civil & Structural Plus to suit your analysis needs. Each uses the same Windows user interface, and has modelling wizards, comprehensive loading facilities for easy and rapid model generation, load application and combining of loadcase results for design checking. Because all levels of the products use the same user interface and terminology, training costs can be minimised and users can be introduced to LUSAS at the most appropriate level for the work they need to do. Universities and research institutions use the academic version of LUSAS, which provides a steady supply of proficient LUSAS users to support your use of the software in your industry.